Curvy - Missing Playmaker Actions! HELP! I bought Curvy specifically so I could animate an object along a spline using Playmaker. I downloaded the Playmaker Custom Actions from http://docs.fluffyunderware.com/curvy/addons.html. The Actions 'CurvyMoveAlongSpline' and 'CurvyMoveAlongSplineDistance' are both missing in the Action Browser. I appear to have everything else, but these 2 (which I need more than any other) are not there. Please advise ASAP - I'm stuck until I fix this! Do others using Curvy and Playmaker have these actions? I've attached a screenshot to show that they are not in my Custom Actions folder. I desperately need these actions to finish a project I'm working on. 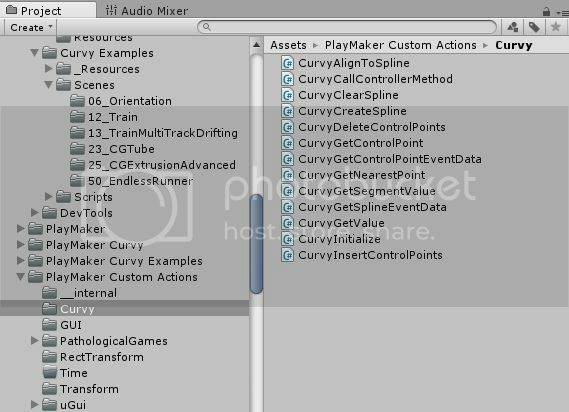 I bought Curvy through the Asset Store, and downloaded the Playmaker actions through the FluffyUnderware site. The 2 actions I need most just aren't there! I submitted a bug report, but I have not heard back from the dev as of yet. If someone who has these actions would be willing to email them to me, PLEASE send me a private message - I'll be forever in your debt! I need 'CurvyMoveAlongSpline' and 'CurvyMoveAlongSplineDistance'. Please, if someone here has these actions, I would very much appreciate it if you'd email them to me! CurvyMoveAlongSpline doesn't exist anymore, instead you interact with regular Curvy controllers or retrieve values directly by querying a spline.